Spring workshops have been added, beginning in April 2019. Members now receive 10% off of all classes & workshops. Members also receive benefits/discounts at select local businesses and free access to lectures and programs. In this workshop you will learn how to make a unique 3D seamless hollow vessel using a simple plastic resist. 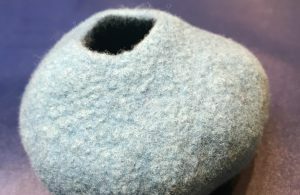 You will also be shown how to use colors and textures, different types of fibers and threads to give your 3D form a personal touch. At the end of the day you will go home with your own unique 3D creation. Materials fee $40, paid to instructor. Celebrate creativity Mother’s Day weekend. Whether you are new to painting or it is a beloved practice, you are welcome. In this non-traditional painting experience you are invited to step into more joy, freedom, compassion and creativity. 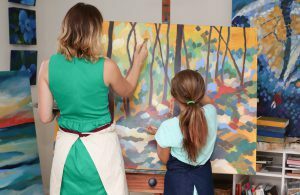 At this session you will get to work on your very own canvas to take home with you and you’ll participate in a workshop to break through creative barriers and step into more joy with local artist, Bronwen Mayer Henry. Painting time for this workshop will be in an intentionally quiet space as a practice of mindfulness. There will be time to connect with other participants and the instructor at the beginning and end. Beginners welcome. This is a sacred space to be gentle with your heart, to find stillness in a busy week/life. Suggested age 12 and up. Materials fee $25, paid to instructor. 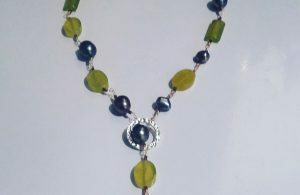 This is a beginner’s workshop where you will learn how to make a modern lariat out of baroque freshwater pearls. Learn basic wire wrapping techniques using the three essential tools creating a chain link effect for a stunning statement piece! Vanilla cupcakes and ‘Numi’ teas will be served. Materials fee $29, paid to instructor.